Zany children's songs with an offbeat sense of humor that's clever enough for adults. Mostly voice and acoustic guitar, but other instruments occasionally invade. 8. Am I in Trouble? 9. Why Do We Have To? Alden's zany songs and energetic guitar playing have been entertaining live family audiences for years. He delights in creating far-fetched and funny scenarios, bringing them to life in song with creative expressions and unexpected rhymes on his album "A Little Cow Music." 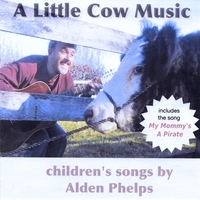 Alden was first inspired to record "A Little Cow Music" in 2006, while eating treats with his family at their local beloved ice cream stand "The Cow." While Alden was slurping on an Italian ice, proprietor Mike Elliot wished out loud that he had a 'theme song' for his ice cream stand, and Alden immediately agreed that it would be a great idea, and set to writing "The Cow Song". The song was recorded and was soon looping on the stereo nonstop at the ice cream stand (contributing to the acute insanity of the dipping crew). From there, heck, all Alden had to do was make up 22 more songs. Some of the lyrics had been rattling around in his head for a while, such as "...please, please, give me cookies! ", while songs such as "Mom's Cellular Phone" were inspired by Baltimore Beltway driving. Alden Phelps is an artist and musician with eighteen years experience as a performer. He has performed at The National Theater, First Night Annapolis, Fells Point Festival in Baltimore, Columbia Maryland Festival of the Arts, Syracuse University, Eastern Connecticut State University, The Gordon Center, Pier Six Pavilion, and numerous other venues over the years. A graduate of the Maryland Institute College of Art, Alden co-founded Open Space Arts center in 1989, where for the next 14 years he wrote and performed stage plays, musicals, and puppet performances. Alden is currently a performer with Young Audiences of Maryland, and performs in Elementary Schools throughout the state.